The International Charter on Space and Major Disasters was activated 13 January to aid the victims of the violent earthquake that shook Port-au-Prince the day before. 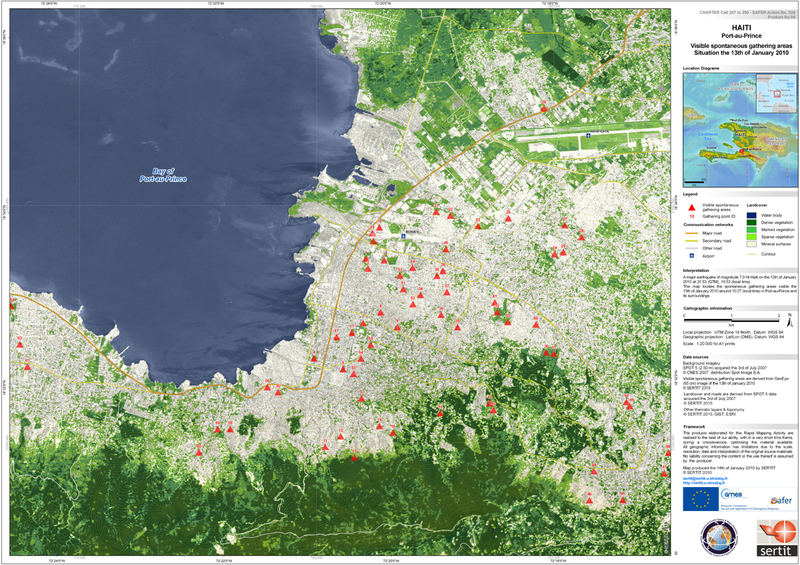 Satellite image of Port-au-Prince derived from SPOT 5 data acquired 13 January 2010. Credits: CNES/SERTIT. The earthquake has left a trail of devastation. The death toll is rising and humanitarian aid teams are working full out to organize the relief effort. The violent earthquake that hit Haiti on 12 January has left gaping scars in the capital Port-au-Prince, just 15 km north-west of the epicentre. Emergency relief teams are facing a long, hard slog to reach affected areas. In crisis situations like this, satellites are precious allies in providing a synoptic picture of the disaster area to assist relief teams. The International Charter on Space and Major Disasters was activated just hours after the tremor. The SPOT 5 satellite, in orbit since 2002. Credits: CNES/Ill. D. Ducros. CNES is coordinating satellite tasking and image acquisition by the high-resolution and very-high-resolution optical and radar satellites operated by the charter’s 10 member space agencies. As early as 14 January, CNES’s SPOT 5 satellite, in orbit since 2002, was able to collect data to generate accurate colour maps of the disaster area at a resolution of 2.5 m. The maps were produced by the SERTIT* regional image processing and remote sensing department in Strasbourg, France. Other satellites operated by the European, Canadian and Japanese space agencies have also joined the effort. The space community is actively supporting emergency response teams on the ground with accurate, timely information to optimize the relief effort.